In February this year I was treated by my partner to a weekend soap boot camp. The weekend was held in a small classroom in Huddersfield stacked full of soap goodies! I was so excited to received this. The itinerary looked amazing as it included soap bar making, liquid soap making as well a labelling and compliance workshop for the soap industry. I was especially interested in the compliance and labelling section as I wanted to make sure all my soap making was as compliant as possible. I learnt a great deal that weekend. Day 1 started early, where I was greeted by Shaun as one of the first to arrive. When everyone arrived, we went around and introduced ourselves. It was nice to see people from all different backgrounds and to hear them explain why they were attending the boot camp. I was surprised to find it an all female class as I personally know men who have soap blogs/websites. The majority of the ladies on the course that day were also here due to gifts from loved ones. One lady had retired and had decided to learn a list of new things over the new few years. After the introductions we dived into what we would learn that day. We started by talking about what soap is, the history and the importance of safety. Shaun had a few horror stories about lye to really let the knowledge sink in. Shaun was so knowledgeable about the whole process that any questions thrown at him he replied with detail and examples. Once all the formalities were out of the way it was down to the good stuff. We took it in turns to weigh the oils and add the lye (wearing all our safety gear of course) and blend our first soap mixture. Some of the ladies had never made soap before so were not used to the different levels of trace. I personally stood back and watched as I felt they could learn more than me at this stage. We made some beautiful soaps as a team, using essential oils and fragrance oils. For our second soap, we dived in to experimenting with colours. Shaun had a huge collection of coloured mica’s and natural clays available to use and buy. I could have spent a fortune in there give me half a chance! We added different textures to our soaps like poppy seeds and dried candela to give them an exfoliating feel. Shaun showed us how to create layered soap, swirls and different patterns on the top as you can see in the pictures below. 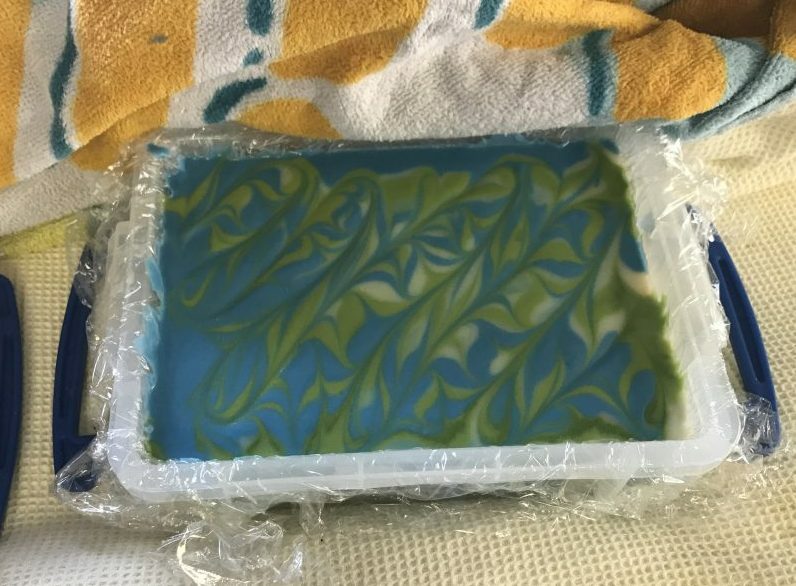 Once all the completed soaps were put to rest under a nice warm blanket to continue into gel phase, we sat down and continued chatting about the different properties of oils and butters. We touched base on how to calculate your lye solution using the soapcalc.com website and how to edit your recipe to include more bubbles, more lather and different levels of conditioning. That was the soap making course section done. After a bit of lunch we continued onto the compliance and labelling making section of the course. At this stage I had my pen primed and took frantic notes. It turns out that I didn’t know much about the labelling side of soaps. I thought I did but oh gosh was I wrong. I took so many notes and made it my priority task when I was back home to edit my labels so they showed the correct information. The next day began with a good old hearty breakfast courtesy of the hotel. I knew I would need my energy levels up for day 2. My knowledge of liquid soap making was limited as I had only attempted a self-taught version once and in very small amounts. To be honest, it had worked but I wasn’t too sure what I had done right in order to do it again! We sat down, went through the safety aspects of the whole situation and what makes a good liquid soap and how it differs from the soap bars we had made the day before. We mentioned water discounting and super fatting and how and why we would do these things. When it came to the practical side of it, I was intrigued to see the stage at which the lye and oils get to trace for liquid soap as I was a little unsure as to when the notice this when I made my first liquid soap. Shaun was very good and encourage us all to step outside of our comfort zone and to be a little less cautious of the process. What was the worst that could happen, right? We made some beautiful soap paste to take home and use to seed our next batch of homemade liquid soap which to be honest, I am still to use. The next part of the course included whipped creams and thick creams. Now this aspect I had never really explored so was a little nervous as I didn’t know any background information about this subject. However, now I do know I may start to incorporate creams into my product list. I’ll have to practice a bit more first. We experimented with fragrances and colours and then tried our hand at clear gel soaps. These were so much fun to make and we got to take a pot home. Mine have taken pride place in my shower. The textures and scents still fascinate me to this day. The day ended with lots of hugs and goodbyes and a few sneaky business cards handed out by me. I made it my future mission to make my website compliant with all my new found knowledge as I knew I would pester Shaun to have a look. Eek! The main lessons i took from the weekend boot camp were fairly unexpected. I learnt to stay patience when dealing with my soaps as rushing things can be far worse than waiting too long. In the end all things can be rectified somehow but if you ruin a good soap because you rushed, you will only have yourself to blame. Another lesson I learnt was to carefully calculate my ingredients. I wasn’t aware how potent some fragrance can be if you accidentally add 3% instead of 2%. It seemed like such a small amount. What really hit this home for me was that my customers are using these products on their skin, trusting me. I would never want to cause any undue reaction, so I am glad that I have never over estimated my colours or fragrances and I can firmly say that I will never do so in the future. I do love to come up with fascinating designs and exotic fragrances but sometimes you have to pull yourself back to basics and enjoy the simple products. My last lesson learnt was my now hatred for INCI names. Those who know what I mean will surely agree. INCI names for ingredients can be a real pain. Who on earth decided that Latin names should be the way to go. I’m also dyslexic which doesn’t help at all! Yes I may have learnt a little Latin at school but I’m pretty sure the furthest I got was the word for tomato! In conclusion, I had a fabulous time, met wonderful like-minded people and generally came away feeling more knowledgeable about my soap creations. I would highly recommend giving Shaun and his team a visit and spending the weekend learning all you want to know. He does so much more that soap making so check out the website at Soap School.